It is no news that South Africa is harvesting the largest maize crop on record for the 2017/2018 marketing season. Due to this, there are a number of factors that have changed within the maize supply and demand estimates for 2017/2018 marketing season. We have already seen a change in low maize prices which were mainly influenced by large supply of maize and recently we saw a change in the export sales demand. In its fifth production estimates, the Crop Estimates Committee (CEC) forecasted maize production to reach 15,6 million tons. Generally, the local demand for maize amounts to 10,5 million tons. This clearly means that South Africa will have a surplus maize crop and thus increasing its export supplies. 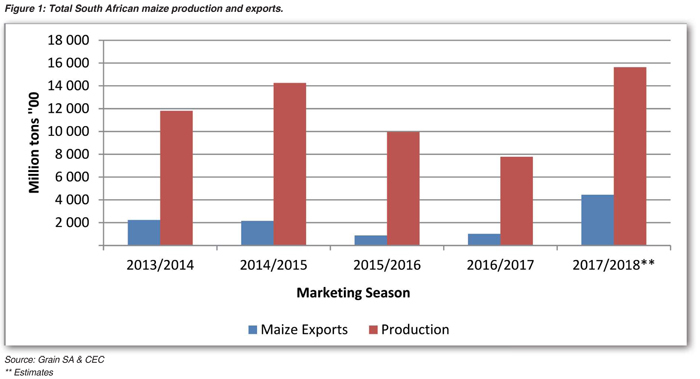 Figure 1 shows the maize production and export figures over the past five years. South African maize exports became more concentrated between 2015/2016 and 2016/2017 due to the drought. This means that maize exports during the drought season were going to fewer countries and mainly within the African continent. Total maize exported in 2016/2017 amounted to about 1 million tons, with white maize accounting 60% and yellow maize was 40%. Prior to the drought, during 2014/2015 marketing season, South Africa exported a total of 2,2 million tons, with about 35% of the total maize accounting as deep sea exports to South Korea, Japan, Italy, Saudi Arabia, Portugal and Taiwan. Looking ahead into the 2017/2018 marketing season, according to the latest supply and demand estimates, South Africa has an exportable amount of 4,4 million tons of maize. This means that the nation has capacity to compete at deep seas level and not just within the African continent. Recent export data from SAGIS indicates that as at 23 June 2017, South Africa has exported a total of 310 791 tons, with 50% exported to South Korea and Taiwan. It is evident that a large crop has a positive effect on South African export opportunities. In order to remain as a net exporter of maize and compete at deep sea, the country needs as many export markets as possible to avoid the risk of depending on a few importing countries as seen during the drought season. Given the expected record crop, which also translates to large exportable supplies, this makes international deep sea market ideal for South African maize. Article submitted Michelle Mokone, Agricultural Economist: Grain SA. For more information, send an email to Michelle@grainsa.co.za.